The C98 units are high performance air conditioners specially designed for internal or external mounting on container bodies where long term reliability, under extreme climatic conditions, is essential. Particular attention has been paid to ease of installation and maintenance. All components are readily accessible with the unit in-situ by the simple removal of servicing panels. To satisfy the demands of modern radar and computer controlled systems, special consideration has been given to EMC and RFI suppression. When RFI seals and honeycomb filters are used with the electrically bonded case, a high level of attenuation over a wide frequency spectrum is achieved. Capacity control is standard feature to eliminate the power surges associated with compressor starting. 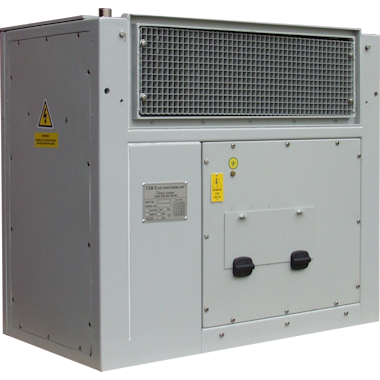 A lightweight ruggedised air conditioner of aluminium construction built to military standards. Although the compact design is ideal for fitting under worktops, the unit is equally at home when fitted externally to the shelter, since it is designed for most severe weather conditions. The standard operating temperature range unit is fitted with a pressure controlled condenser fan enabling maximum efficiency at high ambient, whilst operating with a lower noise level at lower ambients. A choice of remote control units, are available for multiple installations, with a remote temperature sensor to control all units. Control systems are available for 1, 2 and 4 ACU systems. Temperature control is fully automatic with cooling available in ambient conditions from -46ºC to +55ºC. Performance and fault monitoring, self test and remote alarm signals are provided on all control units. Mounting plinths together with a selection of plenum tops and ducts are also available to suit each application.